Ishpatina Ridge is a low, rounded set of humps on the endless face of the Canadian Shield, about 80 kilometres north of the city of Sudbury, Ontario, Canada. At 2,274 feet, it is also the very highest point in the province of Ontario. Maybe it was once the basement of a higher and more magnificent range of mountains... but eons of erosion by wind, water, and ice have worn down this tectonically in-active region. The result of this cosmically-long sanding-down event is a vast area of hard, undulating crystalline rock - perfect for the formation of innumerable lakes, streams, and rivers. I'll be honest: Ishpatina Ridge isn't the type of location I'd normally visit. 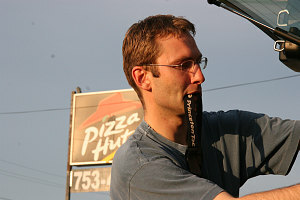 I'm usually trying to find alpine terrain and extra-dramatic scenery. Now, that's not to say that the scenery in the area isn't nice. It's just... well, its just different. Think remote. Think wilderness and endless bush. Think clear, pristine lakes. Think rolling hills and granite outcrops. 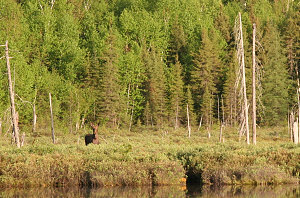 Think loon calls and moose. Think... bushwhacking! So... this mountain isn't my usual cup of tea - but it is the high point of the province, so the peakbagging lure is there. And I'd never seen this area of the province, and I did want to have a look. Roland and I had been planning on-and-off to do this peak, and so, when free weekends for both he and I aligned, we decided to go for it. And, we coerced Jenn into coming along as well! Arguably, Ishpatina Ridge is more appropriately climbed by a canoe-based approach. 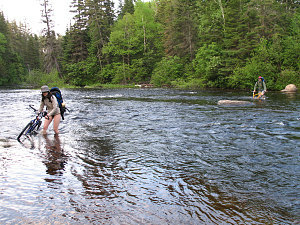 This area of northern Ontario is renown for being a backcountry canoe mecca. As a result, few people approach Ishpatina solely on foot. 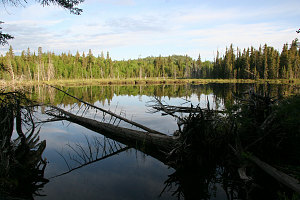 In fact, even though there is a trail leading to the summit, it does not start from a road trailhead - instead, it starts at the end of a canoe route. If you'd like to read a good account of a canoe approach to Ishpatina, click here. 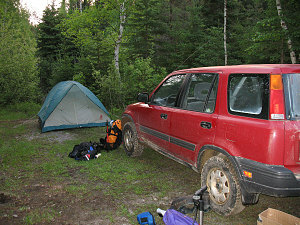 Roland and I wanted to try the single-day overland approach that we'd heard about. A previous climb by Ken Takabi is documented here - although his adventure ended up being more than a day's outing. So, we pored over the notes on the web, looked at maps, planned, and realized that yes, if done properly, Ishpatina can be done in long day. We have to cross this?? We left Ottawa after work on Friday. 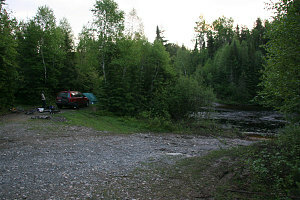 Arriving in Capreol (just north of Sudbury) at dusk, we still had almost 2 hours of driving on logging roads to get to the spot where we'd camp for the night. Based on information we got from a previous overland trip to Ishpatina, we had some good GPS waypoints and knew where to go (there are a maze of logging roads in this area). 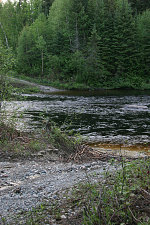 We figured we could get as far as the Sturgeon River, a fairly major stream that we doubted we could cross in the CR-V. Still, that would put us about 15 walkable/bikeable kilometres from the summit, which was well within the realm of possibility for a single-day hike. 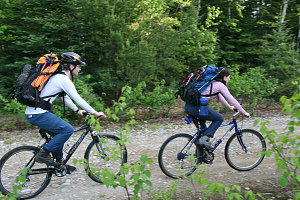 The first 40 or 50 km of the logging road is relatively smooth and wide, and negotiable by just about any vehicle. 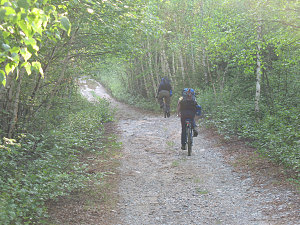 After that, we turned off onto a much narrower and rougher road. At this point it is dicey as to whether or not you could manage the road in a regular passenger car. You probably want something with higher ground clearance, at the very least. We jounced and bounced through the night on the rough road, eventually reaching the ford of the Sturgeon shortly before midnight. A quick glance to the ford itself revealed a very black, swift and deep river. Hopefully we'd be able to cross on foot in the morning! The night was clear, as was the early morning. The weather looked promising! 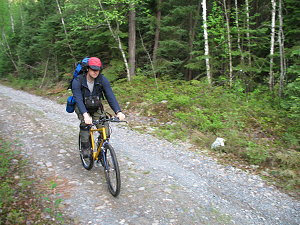 We'd brought some mountain bikes along to help us out - according to our maps, there was another 7 or 8 km of open logging road before wheeled travel would no longer be possible. It made sense to try and minimize the amount of time we spent walking around on roads, in order to give us the most amount of time to tackle the on-foot portion of the trip. 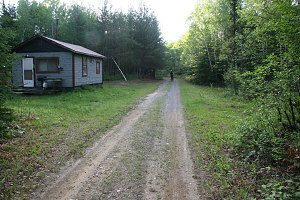 As might be expected in the bush of Northern Ontario, the black flies and mosquitoes were pretty bad. I'd brought my now-unbuyable 100% deet along, and applied it liberally to exposed areas, and covered up the rest. No shorts or short sleeves today! 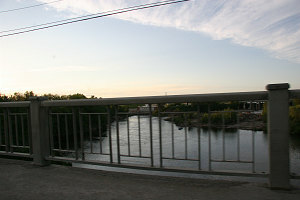 So, the first order of business was crossing the Sturgeon River. It didn't look quite so bad in the morning light, but it was still a substantial river - perhaps sixty feet wide and flowing briskly. 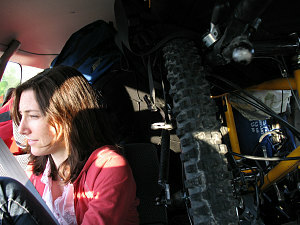 We took our pants off, hid a few things in drybags, put our water sandels on, and started across, bikes in hand. 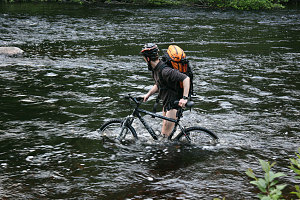 It was about 3 feet deep in spots, and the current tried to take the bike out of your hands. 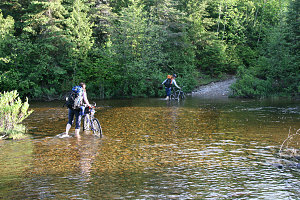 However, stepping carefully and positioning the bike perpendicular to the flow, one could make it across. Jenn, myself and Roland made it safely to the other side. Obstacle one had been overcome! Next it was time to ride. 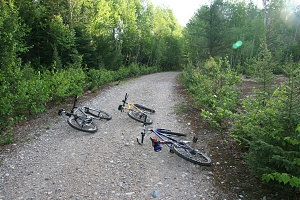 The logging road was in great shape and the hills were gentle. 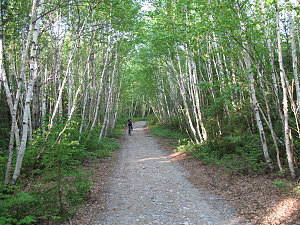 It was a pleasant ride through forest, along the edges of lakes, and across a few small streams. There is a lot of water around here - lakes and streams are everywhere! It was also obvious that it must have rained heavily and for an extended time recently, because everything seemed a bit wet and a lot full. From a description of the overland hike we'd read online (Ken Takabe's), we were hoping to use the shores of a couple of lakes as hiking routes - but this was dependant on water levels, and from the look of it, the water levels were high. This meant that we might have to bushwhack a lot more than we had intended.